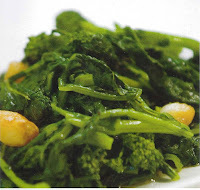 Broccoli was developed in Italy and is well established as one of the major anti-cancer foods. Over the past 20 years, numerous studies have concluded again and again that people who eat an abundance of broccoli have fewer cancers of the colon, breast, cervix, lungs, prostate, esophagus, larynx, and bladder. Broccoli contains indoles, which can help inactivate harmful estrogen that can promote the growth of tumors, sulforaphane, which stimulates cells to produce cancer-fighting enzymes, and beta-carotene, another cancer fighter. Heat a large pot of water over high heat and prepare a large bowl of ice water for shocking. Cut the broccoli rabe into 3-inch lengths. Blanch it in the boiling water for about 1 minute. Remove and shock it for 1 minute in ice water to set the color. Remove and drain. In a medium sauté pan over medium heat, heat 1 tablespoon olive oil. Sauté the garlic cloves until deep brown on all sides, being careful not to burn them, about 4 to 5 minutes. Add the broccoli rabe to the pan. Sauté for about 3 minutes. Season with salt and pepper and serve drizzled with additional olive oil. Recipe From "The Arthur Avenue Cookbook: Recipes and Memories from the Real Little Italy"
Arthur Avenue winds its way through the heart of the Bronx. Known to many as the "real Little Italy," the storied Arthur Avenue neighborhood has been home to a vibrant community of Italian-Americans for over a hundred years. Today, this area continues to thrive as visitors and residents stop to buy a fresh, crusty loaf of bread; to enjoy a meal at Mario's Restaurant; to dawdle for a while at Randazzo's raw bar on a warm summer afternoon; or to hear Mike's Deli owner Michele Greco belt out an aria from Rigoletto and spellbind his customers with tales of the Avenue's past. Ann Volkwein is a food and lifestyle writer in New York City. Currently the features manager for AOL CityGuide, she holds a certificate from the Institute for Culinary Education and formerly worked as a culinary producer for the Food Network. She is a frequent contributor to Gotham magazine and a contributing editor for Explorers Journal. Her previous books include New York's 50 Best Places to Have Brunch and, coauthored with Luiz Ratto, The Healthy Table.